You're driving through the desert on a hot, dusty night. You've been driving for hours and can't take it anymore. You stop for a bite to eat and make the mistake of ordering a drink before you get your food. What the hell; you're drunk now, so why not order another? After two more drinks you're stuck there. 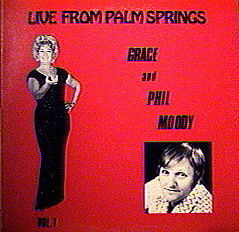 Then, Grace and Phil Moody come out and begin to perform. You realize then that you've died and gone to hell. Or if you're a big Rat Pack fan, there's even a special place just for you! said this page is cool. Ironic, since this page features music unavailable on CD. But I'll take a compliment where I can get it.